Don't worry about anything, but in everything, through prayer and petition with thanksgiving, let your requests be made known to God. And the peace of God, which surpasses every thought, will guard your hearts and your minds in Christ Jesus. I'm a little concerned about the Kureyon Sock. 1 - There isn't a lot of contrast yet. I think I'll have the scarf 1/3 of the way done before I get to the bright colors, so I won't be sure for awhile. That's a lot of knitting before I decide if I'm happy or not. 2 - The Kureyon is a little lighter than the Silk Garden Sock called for in the pattern and it's knitting up a little loosely. When I block it, you'll really be able to tell. (I just started grabbing Noro at the store and didn't pay attention to what I was buying. I think I was mesmerized by the colors!) My gauge on the Tosh is a little tight but I can't go up a needle size because of the Kureyon. The fabric looks good and feels good, but I'm not at the recommended gauge. So what do you think? Keep going or wait until the store opens back up on Tuesday and check out the Silk Garden Sock (if they have it!)? Please excuse the photos. The camera is at Dragon*Con with Steve and Emma. More about that later! Recently I've been listening to podcasts as I do my back exercises. This makes the time pass much more quickly. Mary recommended I listen to 2 Knit Lit Chicks, a mom and daughter podcast which is about knitting, books they've read and a bit about what's going on in their lives. I've listened to a few podcasts (and enjoyed them a lot!) and joined their Ravelry group, where they are encouraging people to make bears for the Mother Bear Project. I had seen the Mother Bear Project website before, but for some reason it really grabbed my attention this time. I felt compelled to knit a bear and now that I've made one I can say that it won't be my last. I'm calling this one Daniel in honor of my youngest brother. I just love this photo! (My brother claims to hate it.) I can't decide which one I like best, so here's the other. Wasn't he a cute kid?! It's tempting to make a straw hat for Daniel Bear, but I think my time would be better spent making another bear. That bear will be his square dancing partner. If you have a few hours and some leftover worsted weight yarn, please consider making a Mother Bear. It's a lot of fun and you'll be spreading some love to a child who needs it. I'm missing the Olympics. As you can tell from my absence here, I was really wrapped up in them. I've watched more TV the last few weeks than all the last year combined. And now I don't know what to do with myself. :) Okay, that's not exactly true, but I am feeling myself reaching for the remote and my knitting then remembering there's nothing on to watch. I participated in the Ravellenic Games and that's why I watched so much TV. I wanted to knit as many hats as I could for 7 Bridges to Recovery and I ended up with ten (plus one that I knew wouldn't be done in time). I also knitted a pair of mitts for Emma because she was going to buy some on Etsy. No way was that going to happen! And I frogged two projects. But now I need to catch up on emails, blogs, etc. It's too bad there isn't enough time in a day to do everything I want to do! I'm looking forward to reading your blogs to see what you've been up to! Finally there is knitting to show! Both projects are gifts and I am happy with them. I love the pattern on the hat and how the decreases are made. Stephen West did a very nice job with this pattern. Update on Google Reader / Typepad: I figured it is probably a Typepad issue because nobody else is complaining about their feed taking too long to show up on Google Reader so I opened a help ticket with them. Then I noticed that the post I was waiting on finally showed up. This is really weird. The day I posted to ask you all about it, the first post showed up all of the sudden. And then when I write to Typepad, the post shows up. Probably just a coincidence, but very weird. So I did resist starting the baby quilt from the fabric I showed you, but I did not resist starting it with these fabrics. This disappearing nine patch block is so fun to make! The weekend wasn't all sewing. I mentioned yesterday that I did some reading. I've been wanting to read The Immortal Life of Henrietta Lacks, but haven't gotten around to it. Emma was assigned this book for freshman reading so I figured this is a good time to read it. Have you read it? I'm about half done and it's really been a good book so far. There are some interesting photos on the author's web site. For sociology class, she was supposed to break a social norm yesterday and see how people reacted. She decided to wear her blonde curly wig to church. And since her dressier clothes were at school (she hadn't originally planned to stay through Sunday), she wore her Flash t-shirt. I should have taken a photo! I was glad she figured out something that wasn't rude. I could only think of social norms that you really wouldn't want to break. Well, I've been on the computer long enough and I need to get to some other thnigs - like buying that quilt fabric! Hope you all have a great day! When I joined the 12 Shawls in 2012 Ravelry group, I read that I would need to make two shawls that used at least 546 yards of yarn. Prayer shawls can be fairly big so I hoped that a prayer shawl would satisfy that requirement. I weighed, weighed again, and weighed some more as I made this shawl. It seemed like I could make it to the required yardage but I wasn't sure if the colors would end in the right spots. Would I be able to end at the right spot and use enough purple? How many rows of green could I knit before needing to bind off? How much yarn would the bind off take? It all worked out. 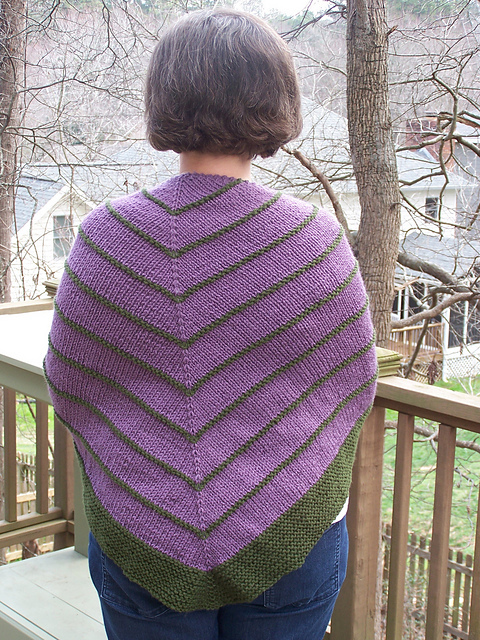 The shawl uses 548 yards of yarn and has the right amounts of purple and green. And it used up just about all of my yarn, too! I do have some other things I need to get knitted, but this weekend I started two new projects: the Rosaleen Shawl and Sunrise Socks. And the socks are for me! Two of my students want to knit socks and I think the Sunrise pattern may be a good one for them to knit. It's for sizes small through extra large which is not common for a sock pattern. And it's toe up so they can easily customize the socks to their feet. I'd like to get one sock mostly completed by Saturday's class then use the other sock to demonstrate how to make the project. I love that the yarn looks like a sunrise! What are you knitting these days? One of the goals I mentioned for 2012 was getting together more often with my knitting friends. That has happened a little, but what has happened more is getting together with my non-knitting friends. I don't know about you, but when life gets busy I don't take time like I should to be with my friends. So I've been fixing that! Last week I met Molly for coffee. I first met Molly several years ago when she was teaching English at my daughter's school. Then we got to know each other better through couponing. Now we're just plain ole friends. Last week's meeting was special because I got to meet her daughter, Audrey. Audrey is ADORABLE! She is such a cute little girl and is probably the most contented 6 month old I've ever met. Molly and I talked for about an hour and a half and Audrey was content until the very end when her eyes were drooping. Nap time! I couldn't resist knitting something for Audrey but I didn't have a lot of time. So I chose Debbie Bliss's Pompon Beret. Notes on sizing are on my Ravelry page and instructions for the crocheted flower can be found at Never Not Knitting. I love knitting with that Cashmerino Aran! Molly and I decided to not let too many months go by before we get together again. Life flies by and before we know it, Audrey will want to run around Starbucks instead of sitting to chat. I guess we'll have to move our get-togethers to the park! "Tinking Villemo" sounds like the name of a movie or something... I was within 45 rows of completing this shawl when I noticed that something wasn't right. I was already at the number of stitches I needed for the last point but I still had three points left to knit. So I compared the width and this end was much narrower than the other end. So I ripped back to the place where both ends were the same width then tinked back to a row I could recognize. It's back on the needles and ready to go but unfortunately I've lost some steam on this project and haven't picked it up since I ripped it out yesterday. I really want to wear it though so I have to start knitting again! Note to self: Do not knit and watch Downton Abbey at the same time. Apparently it's too easy to get caught up in the show and start knitting two together willy-nilly! My daughter got her license recently and I have to tell you it is a really weird feeling to have her out and about on her own. I've never had a problem with her being out with friends or whatever but one of us always dropped her off and picked her up. And I want her to be independent...it just feels strange. So how could my grown up girl want this?